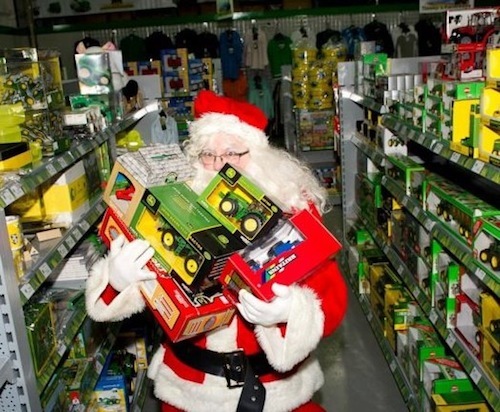 TINNEY’S TOYS OPEN LATE FOR SANTA’S LAST MINUTE RUSH! There’s nothing worse than when Santa forgets to pack EVERYTHING into his sleigh in time for Christmas. And just in case he forgets anything, Tinneys Farm Toys & Models, on the Leck Road in Letterkenny are open to 8pm all this week. There are great gift ideas for boys of all ages, even adults, with PC games including the latest farming simulator, dvd’s like The Big John Deere Vol 1 – 6, and the full range of Tractor Ted dvd’s. Also books, jigsaws, model tractors, cars and lorries, and a large range of clothing for both children and adults. Gift vouchers also available.